MANILA, Philippines – Miss Universe Philippines 2018 Catriona Gray is already breezing her way in Bangkok, Thailand for the Miss Universe competition. While fans eagerly wait for the much-anticipated pageant, Catriona gives regular snippets on the surprises fans can look forward to. Her most recent update was on her Miss Universe national costume. One of the highly-talked about parts of the competition, the national costume competition is where contestants wear a symbol or an icon representing her country and culture. The Bicolana beauty and model shared during a Facebook Live that her national costume is to be watched out for. Without giving away any surprise, Catriona said that it will represent “buong Pilipinas” or the whole Philippines and that it has something to do with Christmas season. She also added that the costume is “heavy”. Catriona is excited and is looking forward for the Miss Universe 2018 national costume competition which will be held on December 10 in Pattaya, Thailand. “I’m really really excited because I’ve never been to Pattaya and it would be really great to explore another corner of Thailand,” Catriona said. Meanwhile, Catriona continues to be crowd favorite as she looks stunning in her Filipino-made fashion pieces. During her arrival in Bangkok, Catriona was seen in an emerald jumpsuit made by Filipino designer Anthony Ramirez and paired it with a shell-shaped clutch bag from a Filipino brand Calli Handbags. For her Thai silk dress fitting, Catriona showed off her T'boli Marsala skirt designed by Niño Franco. She even shared a video to highlight the intricate details on the skirt. 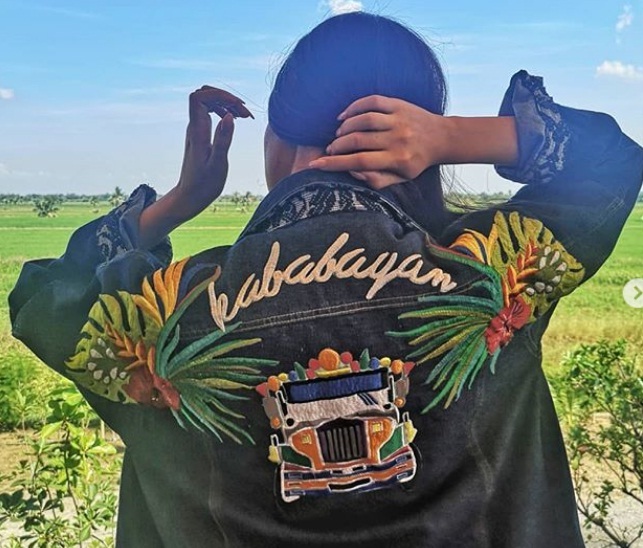 During an eco-farm tour, Miss Universe Philippines wore a denim LAHI jacket with trendy “Kababayan” embroidery at the back. It even features palm leaves and a jeepney. Catriona will compete with stunning beauties from all over the world for the coveted crown of 2018 Miss Universe on December 17 at the Impact Arena in Bangkok, Thailand.